Radios are a vital part of your team’s equipment list. Without a radio, your church security team cannot communicate effectively. Most radios belt clips are flimsy at best. 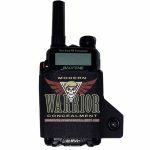 Modern Warrior Concealment’s radio holsters are rugged and will last for years to come. Modern Warrior Concealment offers discounted prices for church security team members. In addition, if there is anything that you don’t see pictured or listed, please contact us and we will do our best to meet your needs!! !